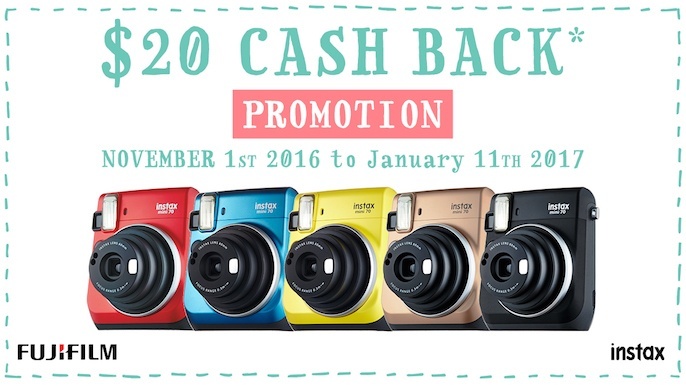 Our instax Cash Back Promotion is In Full Swing So Don’t Miss Out! Put some cash back in your pocket with our latest promotion! We love helping you create instant memories, so you can redeem $20 per eligible purchase with our Instax cash back promotion on select instax camera models. Limit of 5 claims per claimant applies. The promotion runs 1 November 2016 — 11 January 2017, so get in on the fun now. Have we piqued your interest yet? Great, keep reading! How Do I Get My $20 Cash Back? Fujifilm instax mini 8 camera (all colours and mini 8 camera bundle packs) — $20 per camera/bundle pack. Fujifilm instax mini 70 camera (Island Blue, Canary Yellow, Moon White, Stardust Gold, Midnight Black, Passion Red; not including Michael Kors limited Edition mini 70 camera product available from Michael Kors retail outlets) — $20 per camera. Keep your receipt. Hang on to your proof of purchase because you’ll need it to claim your cash back. Without it, you will not be able to participate in the promotion. Fill out the online registration form — on time. You must go here to submit your personal information, payment method, supplier information, product details and upload your receipt as proof of purchase. The latest we can accept your claim is on or before midnight AEDST on 31 January 2017. Get your cash back. Allow up to 28 days after the deadline for processing. Don’t worry, it’s worth it, we promise! Now that you have all the details, go get your cash back. Cheers!